In power distribution some applications are more critical than others. Hospitals, for example, or big stock exchanges like New York and London. Where lives and livelihoods are at stake there can be no break in power supplies. To ensure continuity, hospitals or stock exchanges are protected by multiple interlocking power supplies. If one source fails another automatically kicks in. “Less critical” applications, but critical nonetheless, are those that keep the world going round. Let’s call them critical utility applications. Signage and signalling systems on roads, in metro systems, on railways are typical examples. So, too, is the mobile phone. Since the first devices hit a world of phone boxes and fixed land lines 20 years ago, mobile telephony has secured recognition as being in the public good. One reason is that brings communication to people and communities who had been incommunicado. An essential link in the mobile communication chain is the base station or shelter which receives and transmits signals. Any outage means a break in the phone service. And mobile telephone, like other critical utility applications, can’t afford downtime. Sheer cost rules out interlocking multiple power sources as the solution to continuity of operation. There are just too many mobile phone base stations. And many are located in places that are hard to access rooftops, treetops and mountaintops. If the power distribution unit that feeds the station has an outage, it takes technicians too long to get there. And it might be a waste of their time if the fault was transient. And it often is. So what’s the answer? It’s the little-known automatic reclosing auxiliary (ARA). It’s even less glamorous then the humble circuit breaker. After all, it is an auxiliary to the CB. Yet it has a vital role. The ARA, or automatic recloser, senses fault currents in a mobile phone station’s power distribution box. It waits and reenergises the line, as long as the fault is transient. If the fault is permanent, then it locks into an open position. If telephone shelters and stations were protected only by circuit breakers they would cut off at every hint of a short circuit – particularly in remote locations exposed to the elements. Most overcurrent and short circuits faults are in fact transient. They might be caused by a falling branch or stray raindrop from a storm. They clear quickly. So the automatic recloser is vital: it re-establishes the current. In fact, without it there would quite simply be no continuity of service. You can set your ARA to reclose a set number of times – say three or five. If the fault persists after three recloses, that’s when ARA will lock open, preventing further damage and keeping the installation safe until the repair team gets there. The automatic recloser helps keep operating losses and manual maintenance right down. And it helps optimise any maintenance work that is carried out. If ARA is an unsung hero, it’s precisely because it does its job. So next time you notice a fleeting blip when you’re making a call with your mobile, tell yourself it could be worse. Without ARA, you could be incommunicado. 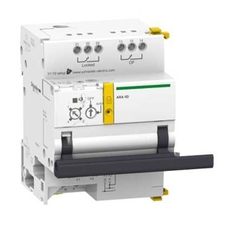 > Know more about Schneider Electric’s Automatic Recloser Auxiliaries (ARA) range. The ARA allows to select the maximum number of reclosing that you authorized. It goes from 1 to 5. Furthermore, in case of immediate triping after a reclosing (this means that the fault is permanent and not transient) the ARA blocks itself for total safety of the installation, and the CB can be reclosed manually only. Regarding the remote control, you can also try to reclose the circuit breaker manually through a remote input control. is we can use ARA with the RCBO. ARA is available for Acti9 iC60 and also Acti9 iID.